Many foreigners find it difficult to get used to the strong taste and smell of the fish sauce. But when they do, Banh Xeo becomes an uncontrollable addiction. 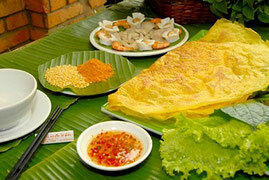 Below are some places in which you can find the very best Banh Xeo in Saigon. This is one of the most popular places that locals frequent whenever they craze a delicious traditional meal. 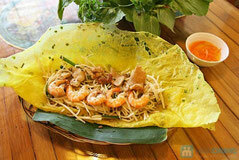 Apart from the good variety of dishes that it serves, Ngoc Son is probably most famous for its banh xeo. People love the friendly service while the prices are extremely affordable. With over 20 years of experience in dishing out tantalizing traditional dishes, you are assured of the best original flavors of “banh xeo” here. Having performed in the US as a Vietnamese folk artiste to introduce Vietnamese “Banh xeo” into the world, Mrs. Muoi Xiem’s restaurant now ranks among the most well known in Saigon. Creativity sets her restaurant apart from the other more conservative outlets in Saigon. Besides the traditional version made with shrimp and pork, Muoi Xiem “Banh xeo” also boasts more than 76 other “Banh xeo” flavors created by Mrs. Muoi Xiem herself. For health conscious individuals, you’ll also be glad to know that her “Banh xeo” is totally healthy with low fat recipes and clean vegetables processed by a high tech machine. 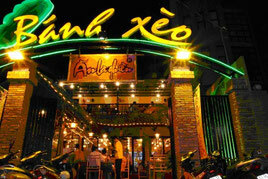 So if you are looking for a more adventurous spin to “Banh xeo”, this is a place you’ll not want to miss. Coming to An La Ghien, you are treated to “Banh xeo” specially prepared to mirror those found in the Southern countryside. Besides its unique tastes, its decorations also introduce you to how the Southern villagers live their lives. With An La Ghien’s signature leaf roofs, red bricks, and bamboo chairs, you will be instantly transported to a more serene countryside – a far cry from the hustling busy Saigon streets outside. There is nothing better than enjoying a traditional dish in its original space, while appreciating the essence of its existence.